On the weekend, my mum, my brother Simone, his girlfriend Audrey, Colin and I went to the Perth Good Food and Wine Show. We went around lunch time with the hopes that all the ‘free’ food would provide us with a ‘free’ lunch. Well yeah there was food, and some samples, but not enough to warrant a meal. What there was, was an abundance of wine! As soon as we walked into the show, my mum went straight to the wine booths. She likes wine. Audrey wanted bread and cheese (she’s French), Simone, well I have no idea what he wanted, I think maybe beer. Colin wanted food. And me, well I wanted it all. Our main intention of going was to see Gary and George from Masterchef, and they didn’t disappoint. They were hilarious! They’re short stint was, well, short. And they kept mentioning time which got a little annoying. 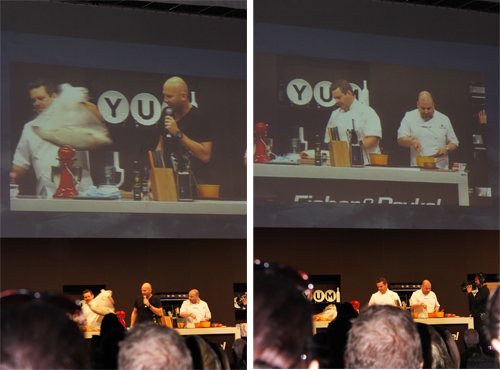 Bonus – Matt Moran appeared on stage. Only for a minute. So for the rest of the show, it was fun. Something different.